With a vivid imagination the imaginary worlds described in books can seem almost real. Be careful what you read, 'cause some imaginary worlds are more real than others. This is my most recent experimentation with shooting action figures, with a bit of a genre mix to include my self portraiture work as well. I got the idea for this shot the first time I watched the credits for the totally awesome cinematic event known as Deadpool 2. The ending credits shows hand drawings of Deadpool interacting with the other characters in interesting ways. This is how I imagine he'd interact with Yours Truly. 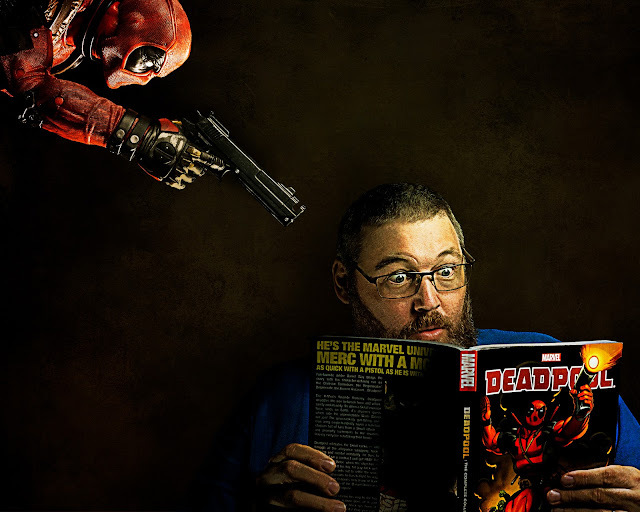 I used my 20" Deadpool figure for this shot, as well as a very temperamental Dave stand in (he's becoming a bit of a diva - it is a bigger problem than you think!). However with some coercion, bribery, and a heavy dollop of Photoshop Magic(tm), I managed to get the shot I wanted.